Numerous outlets are reporting on a recent video involving WBC heavyweight champion Deontay Wilder regarding the aftermath of the person involved in terms of what happened to him. Claiming he didn't know there was a real person inside!! 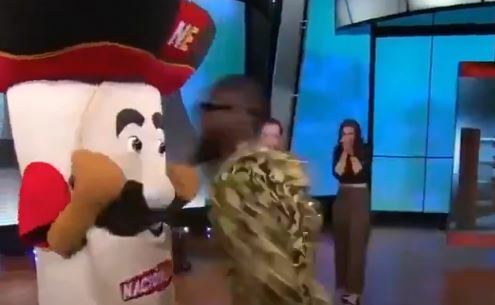 The mascot hit the deck pretty hard at the time but many have now reported that his jaw was broken with Wilder allegedly not knowing there was a person inside the costume. That being said, surely some sort of release form was signed by the guy in the costume before the scene. You can’t imagine Wilder getting in any trouble for this given the fact the guy essentially let him punch him on live television. On a more serious note, Wilder is in the middle of concentrating on perfecting his knockout punches on a legitimate threat next up in the form of Tyson Fury. A fight between two heavyweights on either side of the pond perhaps bigger than any heavyweight fight involving an American and a Brit since Mike Tyson vs Lennox Lewis.